The Wheel in Space picks up where Fury From the Deep, the BBC Radio Collection's previous release, left off, with Jamie (Frazer Hines) and the Doctor (Patrick Troughton) mourning the departure of their travelling companion Victoria. Unfortunately, the story also picks up and rehashes its predecessor's "base under siege" plot and a highly strung commanding officer (in this case Jarvis Bennett, played by Michael Turner) of the type previously depicted in The Ice Warriors, The Moonbase and The Tenth Planet. In common with The Moonbase and The Tomb of the Cybermen, the invaders' modulated voices are at times difficult or impossible to decipher, which is not a good thing in an audio presentation. Sadly, The Wheel in Space is the weakest of the '60s Cyber-stories and the least compelling constituent of Doctor Who's fifth season. The elaborate nature of the Cybermen's plan slows the story down considerably and, when you stop to think about it, which there is plenty of time to do, the scheme is fundamentally pointless. The cyborgs dispatch Cybermats in spheres, which can penetrate the Wheel's hull. The havoc wreaked by the little critters forces the station crew to unwittingly bring the Cybermen aboard. But the Cybermen on the Silver Carrier also emerge from egg-like spheres - couldn't these spheres have entered the Wheel just as easily and saved everybody a lot of time? David Whitaker's script is further let down by some rather dodgy science, as the courses of meteorites are somehow affected by the destruction of distant stars. Like Blofeld in the Bond film Diamonds are Forever, science was never Whitaker's strong suit, but the man who previously worked as Who's original script editor does bring a degree of continuity to the Doctor's travels, by featuring the TARDIS' cryptic warning system (which formerly featured in Inside the Spaceship) and mercury link (which was previously damaged in The Daleks). The writer's fascination with that mysterious metal mercury continues a trend he established in previous Troughton scripts, The Power of the Daleks and The Evil of the Daleks (both due for reissue on CD in August). What guarantees this serial its place in history is its introduction of the new companion Zoë (Wendy Padbury). Echoing the technological horror represented by the artificially enhanced Cybermen, Zoë personifies the dangers of behaving like a machine and restricting one's thought processes to logic alone. Fortunately for Zoë, and unlike the Cybermen or Star Trek's Mr Spock, she grows concerned about her lack of emotion and seeks to better herself, thus making her decision to join the TARDIS crew entirely believable - and, dare I say it, logical? Her commanding officer is less fortunate, however, as Bennett gradually loses his grip on reality as the real world refuses to adhere to his own limited outlook. This audio release also marks Padbury's debut as narrator. The actress provides a lightness of tone and clarity of speech that exactly meet the requirements of the job. 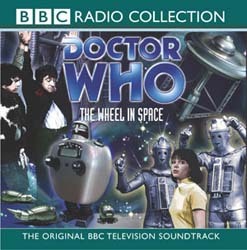 The Wheel in Space is not a classic by any means, but thanks to Padbury and colleagues such as Eric Flynn (as Leo Ryan) and Clare Jenkins (as Tanya Lernov), who play likeable members of the station crew, it's not wheelie bad nor a complete waste of space.